When I arrived in Hilton NY (or North Greece it depends who you ask) in February and was greeted at my residence for the next 3 months by Daena Ford, and her two lovely kids Emily and Ethan, I didn’t know what an adventure I was setting out on. 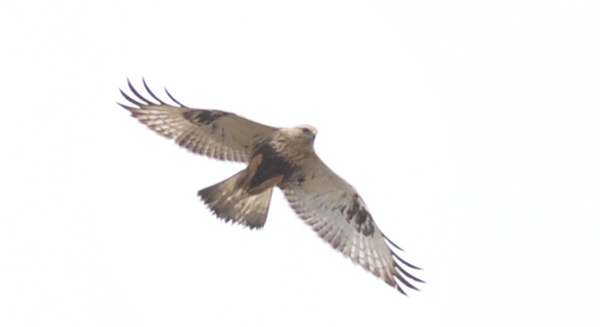 The first few days at the count weren’t particularly memorable in terms of great bird movement, but having Rough-legged Hawks and Northern Harriers as the ‘local’ birds certainly made a pleasant change from the resident Red-tails that hang out at the fall watch I undertake at Quaker Ridge in Connecticut. I had already been warned that Braddock was both one of the hardest and one of the coldest places to count hawks in the country, and I got a taste of that early on. The weather seemed to barely creep into the 30’s on most days and with the wind whipping off the lake, even the feet warmers and super insulated boots that I had newly purchased weren’t doing much to stop me losing the feeling in my feet after a few hours up on the platform. I was getting a tan but it was pure wind burn rather than any hint of the sun until March 17th (St Patrick’s Day) when the clouds suddenly parted and a rush of birds appeared. The flight that day was the usual Braddock mess of birds flung out across the sky. I remember things being somewhat initially confusing as the Turkey Vultures that I had banked on reaching West Spit and then turning for the safety of dry land (before I needed count them) suddenly decided to veer out over the lake and braver species were taking that same lake line short cut to a much more extreme effect. You literally needed eyes in the back of your head to track them as they came back in off of the lake. Thankfully some local birders had shown up and Mike Tetlow particularly helped keep me on track for the day. By the end of the count I had tallied more Red-tailed Hawks than I had managed in a whole season the previous fall in Greenwich, as well as some other goodies including a decent number of Red-shouldered Hawks, almost 50 Rough-leggeds and a rather nice score of seven Golden Eagles! I got back home pleased with the day’s tally and enjoyed getting my first really big chance to meet some of the regular visitors to the platform, who had popped out to enjoy the first decent weather for three weeks perhaps a much as the first respectable count of birds. 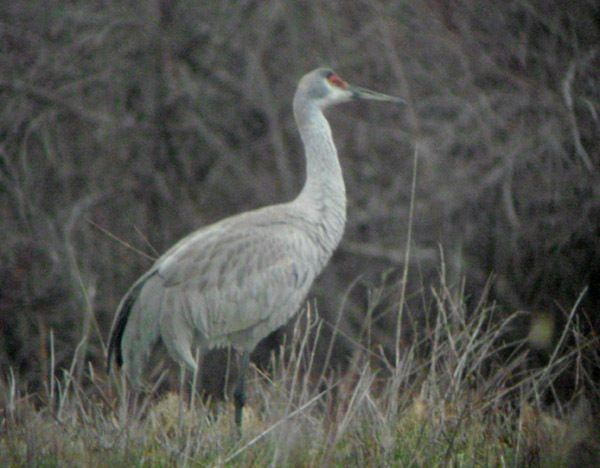 As well as the raptors we also picked up 13 Sandhill Cranes. It’s hard to not be impressed whenever you see and hear one of these great birds so two nice flocks on the day was very welcome. At the end of the session I got the full report on the birds I had most likely missed out over the lake but that didn’t dampen my enthusiasm too much for the first good count of the season (the day in numbers here). By the end of March I had tallied a rather unremarkable 4000 or so birds, with just a couple of decent tallies helping to push the totals up to a somewhat respectable level. There was also little of note in amongst the raptors so far. Although something of a local rarity, for a southern Connecticut transplant such as myself the handful of Black Vultures we were finding weren’t quite as exciting as they were to the local birding community but the constant drip drip drip of Rough-legged Hawks, Northern Goshawks and Golden Eagles were more than keeping me entertained. On the non-raptor front things were a little more interesting as I picked up a Barrow’s Goldeneye and Tundra Swan for my Big Green Big Year (an attempt to find as many birds as I can over the year without using any gas) and a few other goodies for my Braddock Bay area list including Eurasian Wigeon – (which shamefully I didn’t find), the park’s first Fish Crow and a couple of hacked Trumpeter Swans. April rumbled on somewhat inconspicuously on the bird front as again things were fairly fallow for a two week period. Thankfully during this period Daena had persuaded ex-counter Josh Lawry to show up for a couple of weeks and help do some interpretive work at the site. A nice by product of his stay was that he kept me from going completely mad whilst things slowly unfolded during the first couple of weeks of the month. That changed on April 11th when things broke open again somewhat. I have already written extensively about that on my blog (see post here) The count was mainly remarkable in that we achieved our second highest TV single day record ever and got not too far off of 10k birds without having more than a small handful of Broad-winged Hawks, something almost unimaginable just a decade or so back. The other highlight was another decent semi-rarity discovered when I picked up a couple of American White Pelicans drifting over the bay. Again a great deal of debt was owed to Josh, Dave and Mike Tetlow who helped me kept ahead of the game (data). The downside of the day for me personally, but a highlight for everyone else was the dark morph Red-tailed Hawk that put in an appearance at the exact moment I had run to my car to grab some lunch! After a first decent Broad-winged Day on April 23rd (check here for hawkcount data) things again look set for an interesting day on April 27th. Little did I know that April 27th was somewhat auspicious historically at Braddock, as it was the date of our previous biggest tally all the way back in 1987, when hawkwatching superstar Frank Nicoletti was counting. 24 years on and April 27th worked its charms again. With considerable help from Mike Tetlow, Jill Church, Daena Ford and Bridget Watts assisting with both scribing and some of the counting we managed to sneak past our previous big day by a few hundred birds to amass 42, 235 raptors. Not only was it our best single day ever but it also broke the HMANA record for a spring count in Canada and the US. If April 11th had been incredible, then this had been mind-blowing. We had basically just tallied more birds in one day than even somewhere as famed as Cape May has tallied in most of its recent seasons! As well as 39,417 Broad-wings which are both a site and spring US and Canada record we also equaled our highest counts of Ospreys at a rather more prosaic 60 birds. The flight on the 27th was eventually broken up by a rather nasty storm that blew in accompanied by tornado warnings. The next day, the 28th was a mop up session. But mop up makes it sound much easier than it really was. Its funny people always focus on the 27th when they ask about the difficulty of counting a flight at Braddock but in reality the 28th was much harder, as it was insanely windy (gusting to about 60mph) and the birds were strewn across the sky in a completely haphazard manner and bombing through fast and low as far as the eye could see (no nice thin constant stream today). In a few crazy hours I had almost been decapitated by a Northern Goshawk on West Spit and crammed almost 5000 Broad-winged Hawks into something of a wild hour long period as soon as I arrived in the park. It was a great experience for photographers and those just wanting nice close up views of birds, but something of a nightmare for yours truly trying to keep at least a vaguely professional count in order. With April at an end we had already reached about 85,000 birds, a highly reputable season in and of itself, but now there was talk of cracking 100,000 birds and other such notable achievements. Again though we began to hit another fallow period and this time it wasn’t a two week period but almost a month of seemingly endless northeast winds and clear cloudless skies devoid of bird life. By late May all thoughts of cracking 100k birds had receded into the distance and the chance of 90k birds looked like it might even go begging. That said May 23rd seemed to be aligning itself nicely for some movement, if only there were any birds left out there in the wilds of North America still to count. After daylight broke on the 23rd the first few hours gave little hint of what was to come. With the accipiter flight essentially done for the season there was no morning rush as there had been on other big flight days and things started more with a whimper than with a bang. 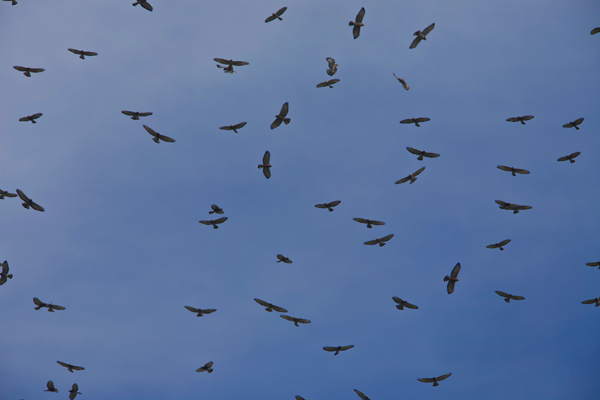 However, as the huge storm front started to blacken the skies around us swarms of Broad-winged Hawks began to gather and then rush headlong away from the imposing skies. Within a madcap hour, again with much help from Mike Tetlow and Bridget Watts we tallied over 10,000 Broad-winged Hawks and crashed through the 100,000 raptor mark (hawkcount data). With 100,000 birds tallied on the season all we had left to aim for realistically now was the 106,644 raptors that represented our second highest annual tally from 1987 and to pick up a couple more interesting birds. The interesting birds front score was attained on May 28th when after a morning of being distracted by damp weather (and lots of warblers) I popped out to do the count as the skies cleared. I stopped at Steve’s convenience to grab coffee on route to the park and seeing as I was going right past decided to stop in at Frisbee Hill (our inland site). I guess what they say about being lucky rather than good held true, as no sooner than I arrived than an adult Mississippi Kite put in an appearance at treetop height (days count here). With 100k birds now surpassed and the Mississippi Kite adding to the Swainson’s Hawk as our raptor rarities on the season I waited for the possible push of ‘southern’ Bald Eagles. 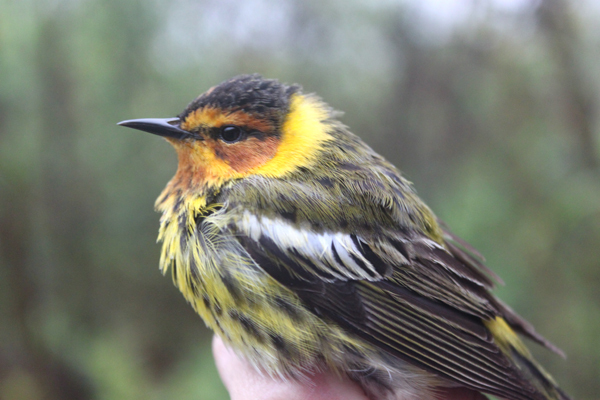 Birds hatched in Florida in February begin to move north in April, pushing for up to 2,500 miles to places as far away as Manitoba, Canada. 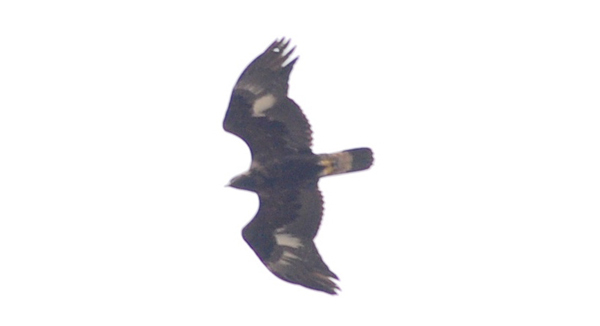 This movement can often find large numbers of late migrant eagles pushing through Braddock Bay when circumstances are ideal. These fairly ideal circumstances happened on one of the last days of the season when we had an incredible 94 pass through the site on May 29th. This included seeing kettles which included six or seven birds at any one time. This was amazing stuff, and happily the opportunity to marvel at an environmental success story writ large across the Lake Ontario skies (days data from hawkcount here). Daena had already told me that the season wasn’t over until the Mississippi Kite had flown and now it had, but there were still a few hundred birds to go before we cracked the standing second highest total tallied in a season. Those birds duly arrived on May 30th when a couple of hundred Broad-wings and Turkey Vultures put in an appearance. With work already lined up in Connecticut I couldn’t make the official last day of the count, so Mike Tetlow kindly filled in for me to push our tally up by another few hundred birds and with a few birds drifting through still, Bud Morgan and Bob Spahn (who had helped by tallying birds on May 24th when I couldn’t make the count) put together a nice little flight on June 1st including another good Black Vulture. 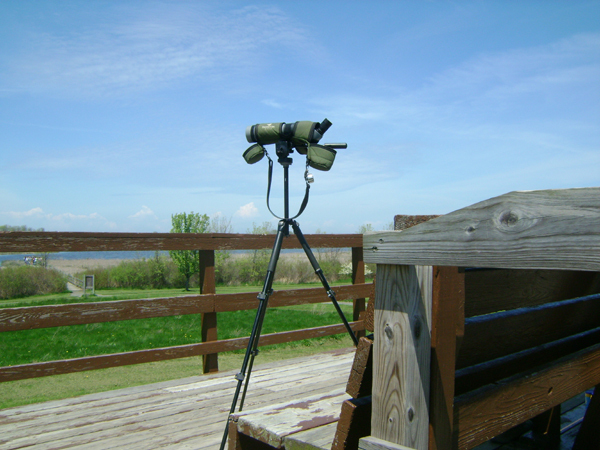 For more information about Braddock Bay Hawkwatch check out their website (click here). They do a great deal of fantastic educational and conservation work with a dedicated and purely volunteer staff so please consider joining or donating to them. You can go and keep up with the latest endeavors and events by ‘friending’ them on facebook if you have a facebook account (check them out here). Thanks to Josh, Ryan and Steve for the loan of the shots for my blog. Good to hear from you. It’s an amazing place and totally worth a visit. Hope to catch up with you soon. Thanks for your help and company over the season – it was appreciated. Is liking Turkey Vultures weird? They certainly aren’t the most lovable looking creatures on the planet but any sign that winter is over has to be a good thing in my books! Look forward to seeing you next year.